While running some lighting experiments I stumbled upon the glow lamp effect. I am intending on applying some pretty to the base and presenting it as a gift. You will be working with a deep vacuum in glass, high voltage and compressed argon gas, be sure to play safe. Use all appropriate safety precautions. Step 1: How It Began. 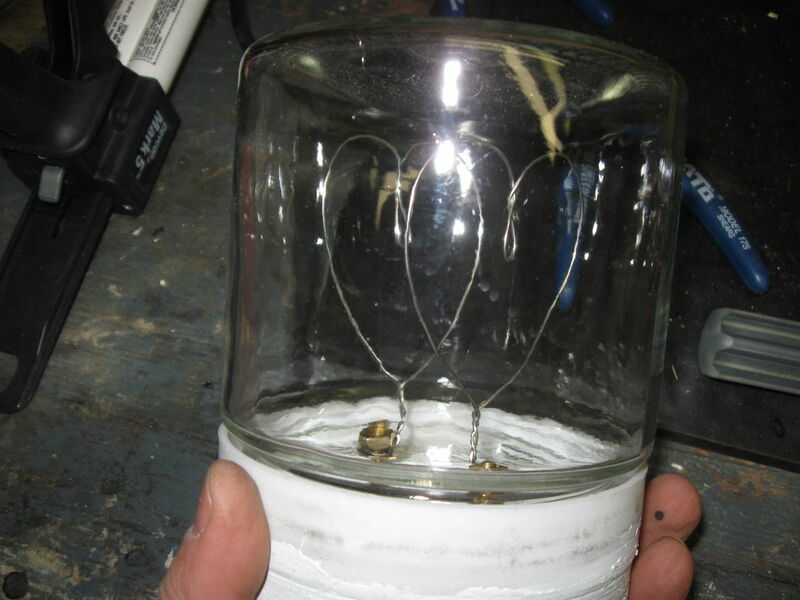 This experiment started out as a way to build a Nixie Tube. (I will show this in another instructable). This led to extensive reading and research on the subject. I was playing with a cold cathode lights as a way to power the tube and the result was shown here. 1/2 inch thick ABS plastic. You are going to have to draw a deep vacuum on the jar. This can be difficult to achieve so it is best to over-build the lid. This is the same way I made the experimental lid. I used a storage type jar that has a 2 part screw on lid. I removed the stainless cove and was left with a plastic screw ring. Next I cut a disk out of the 1/2 inch ABS using a 4 1/2 inch hole saw. This was the exact outside diameter of the plastic ring. I marked 2 points in a straight line with the center hole at 1 inch each from center. These 2 points were then drilled and tapped to accept a 10/24 screw. I also enlarged the center hole with a 3/8 bit about 3/4 the way through the ABS from the outside side. I first cut the Schrader adapter so that there was less than 3/8 of in inch of copper tubing attached then roughed the surfaces of the adapter and ABS disk with abrasive. I mixed the epoxy then placed some on the Schrader adapter tubing and pressed it into the outside side ABS disk. Next I placed an electrical eyelet on each 10/24 screw and thereaded them into the holes from the outside side of the ABS disk. I placed a small amount of epoxy on the threads then screwed them tight into the ABS. On the inside side of the ABS I placed some epoxy on the exposed threads near the ABS. Then tightened a 10-24 nut onto the screws. The epoxy was used to create a vacuum seal. Next I used the Plastic Welder ( epoxy) around the inside perimeter of the ABS disk then pressed the jar screw sleeve onto the adhesive. I turned the sleeve about 1/4 of a full turn to get an even coverage with the adhesive. I then smoothed the adhesive that was squished out during the pressing. The seal happens mainly at teh jar edge so take care to smooth this area as much as possible. I used a center punch to first flare the exposed copper tube on the inside side of the lid then a pin punch to flatten it. This was done before the epoxy began to set and was done to give a better seal. This lid was set aside to cure for 24 hours. I looked long and hard to find a local source of nickel wire. I chose a readily available Nickel alloy wire called Nichrome. While I cannot be sure of the chemical composition it is usually somewhere between 60% and 80% nickel.Turns out that this worked fine. I acquired a cheap dryer element from a local appliance pares distributor. I cut a section of coiled wire from the element then straightened it somewhat prior to bending it as I needed. You will need to make two very similar shapes. I chose to make these in the shape of hearts. Try to make them as similar as possible. The lower attaching point was made by wrapping the wire around a needle nose pliers and bent at a right angle as shown. The electrodes need to be as parallel as possible to one another. Use 2 10-24 inch nuts to secure them to the 10-20 screws and make sure that the do not touch.Make sure that they are tight on the brass screws and aligned with one another. I cleaned them with contact cleaner before assembling the jar. Initially i used a heavy bead of silicone to seal the jar but even after waiting 48 hours this dis not seal properly. It took extensive cleaning to remove it all. Wait at least 24 hours for the adhesives to cure. The output leads were soldered to the eyelets on the brass screws. On the refrigeration gauge set the yellow hose goes to the vacuum pump, the red to the argon regulator and the blue to the jar Schrader. I drew a deep vacuum on the jar for 30 minutes then let it st for an hour to leak test. Then I ran the vacuum pump for another 15 minutes. Turn the vacuum off then add a little argon bring the pressure up to less than 4 inches of mercury. Still the jar is in vacuum. Then re-vacuum for 15 minutes. Again add the argon as before. This time turn the power on to the lamp. Then activate the vacuum pump. You will see an arc at the place where the electrodes are closest, as the vacuum deepens you will see the arc spread out and the electrodes will begin to glow in a uniform manner. I found that this happens at around 25 inches of mercury. Turn the vacuum pump off when you have a uniform glow. If the glow lessens and becomes not uniform, you have a vacuum leak. This will have to be isolated and eliminated. With no leak the blue hose can be removed and the adapter cap lightened into place to create a seal. Mine still is not perfect and I have to re-argon it after about 2 days. The display base was cut using a 4 1/2 inch hole saw from 2 scrap 2/3 pieces of wood glued together. I will be posting how to make a Nixie tube like this shortly. how can you use a vacuum and argon at the same time ?? that's really weird? + where do you get a bottle of argon in the first place? Thanks... that is what I was planning. Yes there are smaller cylinders you can get of Argon. Contact a local welding supply company. There are also small canisters for reserving wine. Here is a link to show you what they look like. Just not sure if they will be enough for this project. Nice application, looking forward to the nixie-tube. I've had some luck in finding Cold Cathode Drivers in slightly older (90's) flatbed scanners. would a CFL driver circuit work for this application? Probably but it would be overkill in this application. A cold cathode driver is more appropriate, usually they give 200ma at 1500-2000v.